Let’s face it, being one with the wilderness isn’t exactly everyone’s cup of tea—but it doesn’t mean that everyone should miss out on the great experience of camping. As the name suggests, Glamping is the less rugged, more luxurious alternative. The ‘Glamorous’ take on the traditional ‘pitch a tent and sleep on the floor’ type camping provides a different means of accommodation so that you can see the very best the outdoors has to offer—in moderation, of course. Glamping generally entails showing up to the “campsite” which more closely resembles a large tented-hotel room and settling in. No effort required. Fit with bedding (yes, an actual bed), lighting and power. Not a sleeping bag in sight. Outside your typical tent-type glamping, there are all sorts of experiences on offer, such as airstreams or trailers, domes, cabins, huts, cottages and more. Some destinations offer comforts like meals, wifi, heating and cooling and even a kitchenette. Forget ducking into the woods to ‘take care of business’ – bathrooms are either included on site or are a short walk from your residence. Despite being an unconventional take on the ‘traditional’ camping, the appeal of experiencing the wonders of the great outdoors in comfort and style is understandable. The trend is gaining a serious amount of traction and with the warmer weather ahead of us, now’s the time to set a date for your inspired retreat. There are hotspots for glamping right across our beautiful country, so it’s a great idea for a getaway whether you’re in Victoria, Queensland or just about anywhere else. Check out some of the more popular glamping spots across Australia below. Mobile phone and charger, you may or may not have reception and wifi. Snacks – because you should always have snacks? Day clothing and footwear – opt for something comfortable for outdoor activities, it may be glamorous but you won’t be needing an evening gown. Be sure to slip slop slap before heading out for any adventures. Beach towels & Bathers (or skinny dip – I’m not the boss of you). Food, cooking utensil & plates if meals aren’t included – BBQ meals are never amiss. Toiletries to keep yourself looking and feeling civilised – who knows, you may impress a koala. Jammies fit for a slumber party in the great outdoors. HandiTheatre® Explorer (we’ll get to that later). 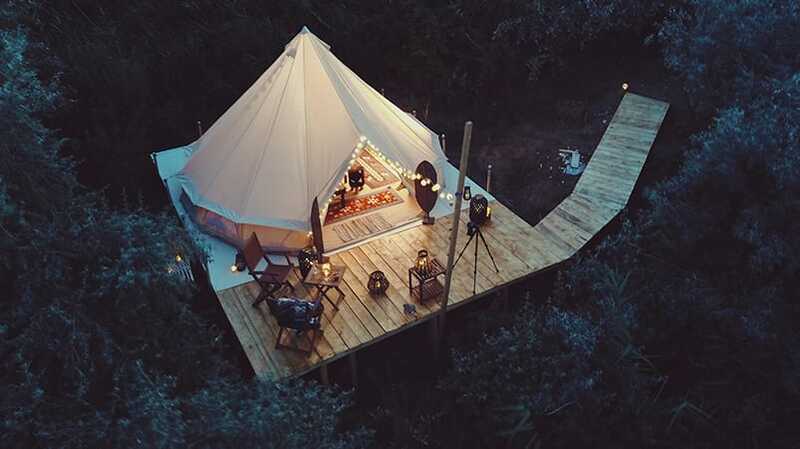 Bear in mind that all glamping experiences and inclusions are different, so some things may or not be applicable and you’re your own person, bring what makes you feel comfortable – that’s the glamping spirit! While you’re ‘roughing it up’ with a warm cup of tea and cosy blanket, why not catch a flick on the big screen. The HandiTheatre® Explorer is portable, battery operated and incredibly easy to set up. The small but almighty projector provides a stunning image on the 100” inflatable movie screen, accompanied by the high quality Behringer speaker. Just bring along a USB, or plug in a laptop to enjoy an unforgettable movie night. Without the need for camping equipment, the Explorer will be the #1 item on your packing list. 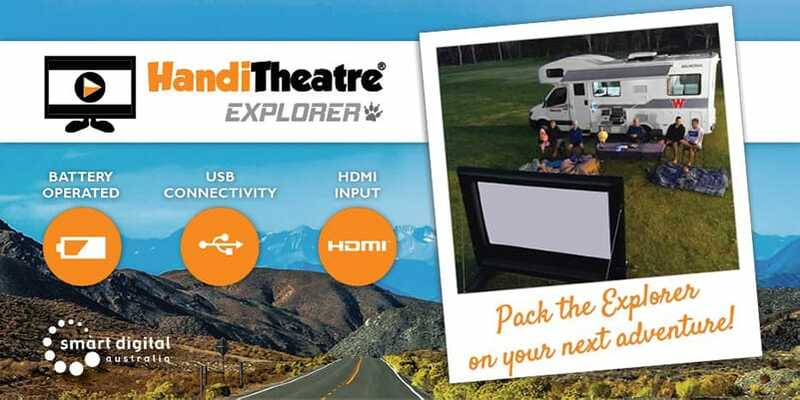 Check out the HandiTheatre® Explorer for a cinematic experience under the stars.